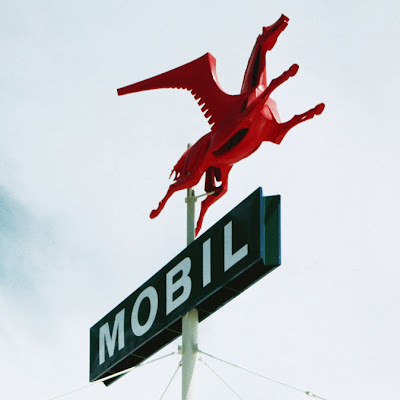 Dinosaurs and Robots: 1956 Mobil Station, Anaheim, Calif.
1956 Mobil Station, Anaheim, Calif. The Mobil gas station that was once located across the street from Disneyland was a marvel of mid-century design by Whitney Smith and Wayne Williams. With the giant floating canopies balanced precariously on spindles, underneath a fire-engine red flying Pegasus, the station was an eye-catching roadside masterpiece - even catching the eye of famed architectural photographer Julius Shulman. Do we need to even mention that it's long gone now?